In case you missed the Santos de Cartier event at The Dubai Mall two weeks ago, as part of Dubai Shopping Festival (DSF), check out the photos on our events page here. 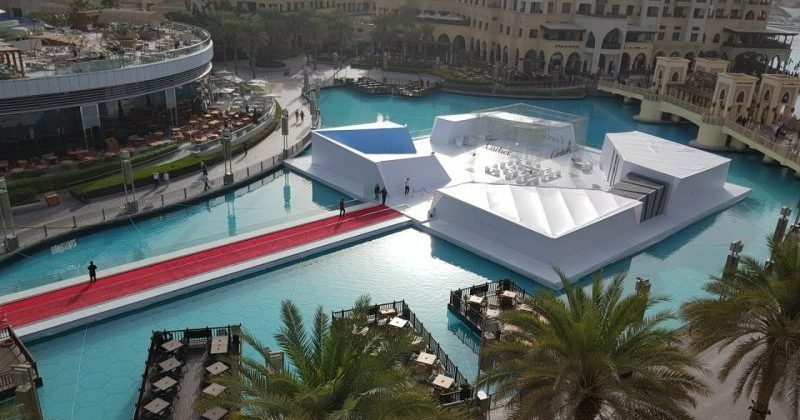 ​Ecocoast was contracted to supply and install 1800 m2 of floating pontoons to support the Cartier pop-up structure, inspired by the innovative Alberto Santos Dumont airplane. Showcased at the Dubai Fountain, the statement installation allowed visitors to discover the new Santos de Cartier collection as well as the world aviation pioneer, Alberto Santos-Dumont who inspired the creation of the original pilot’s watch, through a series of experimental and immersive rooms. ​Interested in knowing more about our floating pontoons and different service options? Call us at +971 4 885 3944, or simply submit our website form.